Euro gold remained at about €900, platinum gained $17.30 to $1354, and copper fell a few cents to about $3.19. Gold and silver equities fell over 1% in the first half hour of trade and remained near that level for the rest of the day. There were no major economic reports today. Tomorrow brings the Trade Balance, New Home Sales, ISM Services, and the fed’s Beige Book. Oil jumped higher after TransCanada Corp. said it will begin operating the southern leg of its Keystone XL pipeline to the Gulf Coast in January. The U.S. dollar index fell ahead of this week’s major economic data and fed commentary. Treasuries rose as the Dow, Nasdaq, and S&P fell on continued concern about possible fed tapering. Among the big names making news in the market today were Nintendo, Chrysler, Amazon, EBay, and Apple. 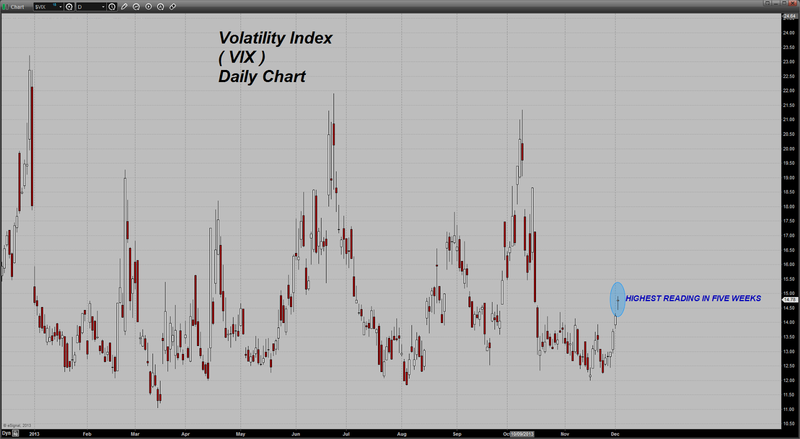 “One of my favorite Sentiment Indicators has been and continues to be the Volatility Index or VIX. I prefer to call it the Complacency Index. Low readings, such as we have been recording for some time now, indicate the absence of investor fear or concern. High readings reflect worry or uneasiness. Sky high readings indicate PANIC. I am not sure what is going on but the VIX has scored a five week high today for some reason. I tend to watch this indicator in conjunction with the action in the equities as a way to gauge any potential shift in overall confidence. In my view, the only thing that can bring a firm bid into gold and reverse the current bear market in the metal is a heightening of fear/unrest/unease or better, a growing lack of confidence. Yesterday we had a move higher in the Dollar. Today that has been erased. With the Dollar weakening gold is getting a bit of a bid today. Also aiding the metal is the sharp, and I do mean 'sharp' rise in crude oil. It touched $96 ( basis WTI ) in today's trade and is currently up over $2.00 barrel as I type these comments. Let's continue to monitor the progress of the VIX and especially monitor the price action in the S&P 500. Upside momentum continues to wane in the latter market but then again it has been for some time now. I keep picking up one negative divergence after another but the market keeps shrugging those off with dip buyers continuing to come in. If the stock market does finally actually respond to one of these negative chart signals, I expect the VIX to jump even more. At that point we will watch gold closely to see if it can gather some better buying interest. COMEX Gold Trust (IAU) Total Tonnes in Trust: 169.16: -0.81 change from yesterday’s data. Silver Trust (SLV) Total Tonnes in Trust: 10,309.02: No change from yesterday’s data. Barrick’s (ABX) tender offer, Seabridge’s (SA) NPI sale, and Great Panther’s (GPL) updated mineral resource estimates were among the big stories in the gold and silver mining industry making headlines today.